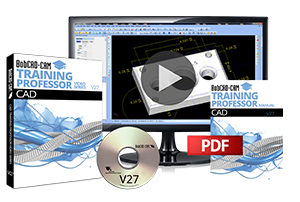 The v27 CAD Training Professor Book & Video Series is a comprehensive training package geared to help you master your CNC programming software at your own pace. The training lessons cover all of the aspects of CAD Design while using the latest v27 CAD-CAM software. This new BobCAD v27 CAD Design training series is like having a personal training professor in a box, teaching you everything you need to know about the BobCAD software from A to Z!